In case you missed it Wednesday was National Kale Day. Yes, vegans, health nuts, and leafy greens lovers every where finally get a day to celebrate this superfood which is met with mixed emotions most everywhere except on food blogs. In case you missed it this year, make a note – the first Wednesday in October from here on out – #NationalKaleDay. My last post featured a round up of some fabulicious recipes from equally fab bloggers, as well as a few fun facts and health tips about Kale. Check it out if you want some really creative uses for kale. Today, it’s just a salad – but a salad that I think appeals to both kale lovers and kale on-the-fencers. Because baby kale, isn’t at all like it’s grown up, wrinkly and let’s face it – tough much older sibling. Baby kale is tender, sweet, and just perfect for eating raw. Or for just testing the kale waters if you’re not really sure about the whole thing. Kale is perfectly in season in the fall – right at the same time that apples are at their peak. And cranberries (although I use dried here) And of course there’s, pumpkin – I had to include it, in the form of pumpkin bread croutons. I love walnuts for their heart healthy omega-3 fats, and smoked gouda, well, just because – but feel free to substitute pecans and cheddar if you’re so inclined. 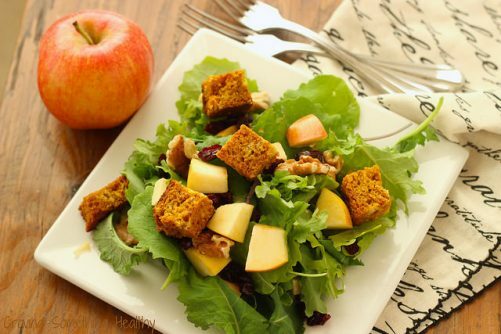 The croutons are a perfect way to use up leftover pumpkin bread. Except who am I really kidding? I would never have leftovers in the pumpkin bread department. I even scrape the soft crumbs that get left on the bottom of the pan and devour them before anyone comes into the kitchen to ask what smells so good. Bake bread cubes for 15-20 minutes until lightly toasted. Turn off oven, open the door a crack, and let bread cubes sit until cool and crisp. Set aside until ready to use. 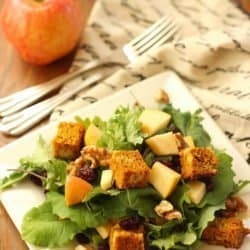 Add kale, walnuts, apple cubes, cheese, and cranberries to a large mixing bowl and toss to combine. Mix vinegar, oil, maple syrup together and whisk to blend. Season with salt and pepper to taste. 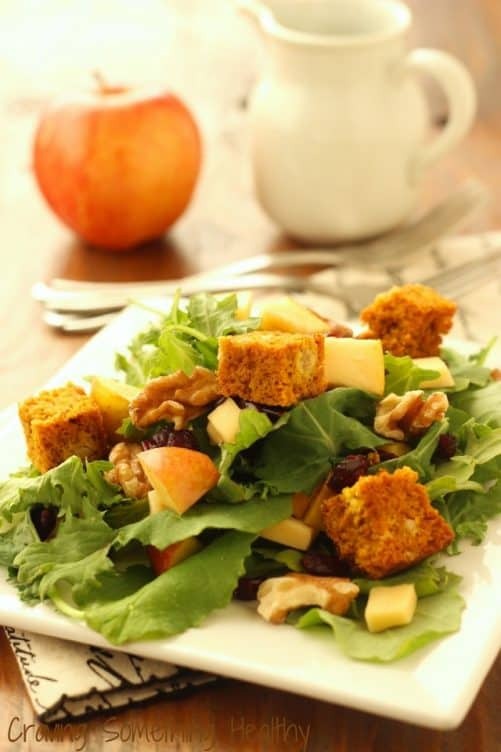 Pour desired amount of dressing over salad just before serving, Top with croutons. How do you feel about kale? Lover or hater? Previous Post: « All Hail To The Kale! I wish kale was more readily available here in Australia…it’s $8 a bunch! I love the taste though and pumpkin bread croutons? Epic!